The actual log file is much bigger and there are lots and lots of lines that end with "(too few)". What settings should I try changing to get this to work? Thanks! It seems to me that none of your tracks are rated. Is there a checkbox on the "More" popup to include tracks that are unrated? I'm having a little issue with this script concerning albums from various artists. I have the current setup: the script chooses albums from a collection. The collection contains 1 criteria: "playlist is x" where X is a number of static playlists that all contain one album. Aside from that I have no other parameters set except that the LastPlayed(days) = 366. The script works fine for normal albums. However there are also a number of albums from Various Artists in the collection. From time to time the script picks out 1 song from such an album and after it is played it proceeds to another album. I would expect that the script plays the entire album of Various Artists. Is that behavior intended or not? My Various Artists albums are tagged like this: the artist tag contains the correct artists (which all differ from each other) and the albumartist tag contains "Various Artists" for all the songs on the album. I noticed that the script played a split album correctly. The split had "Artist 1; Artist 2" in the albumartist tag and the script correctly played the split album fully, first the songs from artist 1 and then the songs from artist 2. Hmz, after testing this some more it seems the script is actually throwing in random songs from time to time. Okay, so I figured out what causes the random tracks to appear. The logfile says "[number] has 0 tracks above minimum rating (too few)" for most of the albums and when it encounters 100 of those it plays a random track. I don't want rating to be a criteria and I haven't set it either. I've tried min rating = unknown and min rating = 0, but both cause this problem. Please advice what to do. The script will always throw in a random track is it can't select an album. When the message says it can't find any tracks above the minimum rating, if you've got it set to "unknown" then it will be including unknown tracks, which effectively means you don't have a rating criteria, I just didn't bother to put in loads of different messages depending on the different settings. You probably need to check your filter and genre settings as well. 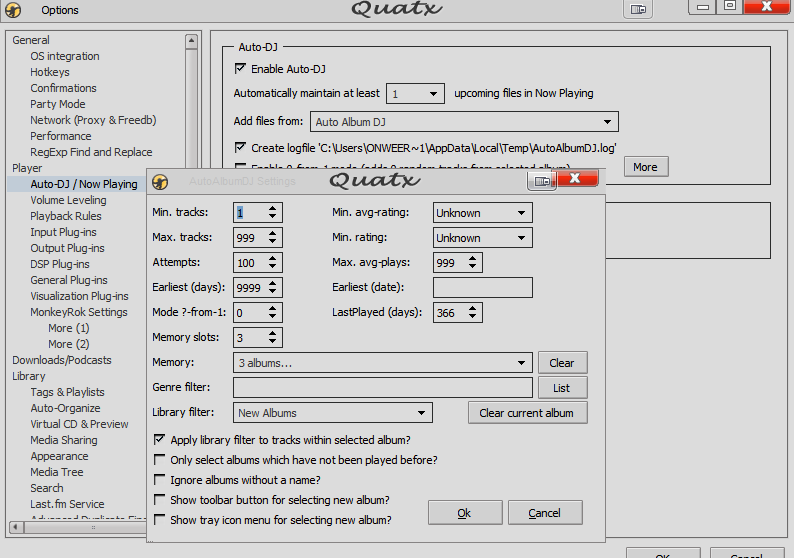 Hi Trixmoto - Not sure if your still doing any development on this but a couple of features i would like is to be able to select more than one library (or Collection as they're now called) and to have some % parameter between the libraries so trhat i could select say 70% from my Jazz Collection & 30% from my Classical Chamber Music Collection. Thanks, I've added for you suggestion to my list for the next version. Am I correct in understanding that the script works like this? 2 It then checks if the selected track and all of the other tracks from that album meet the criteria. If not it goes back to 1. 3 If the criteria are met the album is queued. If not it selects random tracks until the number of [attempts] is met and then selects a random track from the available tracks to queue up. If this is correct then the way I want to use this script really doesn't work very well. What happens a lot is that AADJ selects 999 (max number of attempts) tracks that do not meet the criteria and happens not to randomly select one of the tracks that does meet the criteria. I then end up with a random track. I think the script does not keep track of the tracks that it already tried to select in an earlier attempt. Which means some tracks get attempted several times and of course fail each time. Would it be possible to have the script check for that to prevented multiple attempts at the same track? Additionally, I would like to have the maximum number of attempts to be (much) more than 999. I don't mind if the script takes some time to find something that meets the criteria as long as it does. Okay, so I set attempts=9999 in the MM.ini file which seems to work, which is a big improvement. It would however be nice if I could set that in the script options since otherwise I will have to edit the .ini file each time I make a change of any kind to the script's settings. The script is designed to play whole albums. If you've only got about 30-40 tracks which meet the criteria, then I don't think this script will work for you. You misunderstand. Those 30 to 40 tracks constitute 4 to 6 whole albums. Usually on Sundays I reserve my listening time for recently released albums. I find that this goes well with my weekly housecleaning tasks. I have a static playlists that contains about 30 albums. New albums get added to that playlist and once I've heard an album enough times I take it off. I call this playlist Heavy Rotation. I have a collection that has Heavy Rotation as a criteria. This collection is the basis for AutoAlbumDJ. So what happens is that AADJ plays albums from Heavy Rotation each Sunday. But it does so with the criteria that songs from the album must not have been played in the past 15 days. Thus if I play an album on a given Sunday it will not be played again on the two Sundays after that and it comes back into rotation on the third Sunday after it was played. As a result there are usually a few albums that are 'in rotation' on any given Sunday. Which means the script should work as it needs to pick out one of those 4-6 albums that are 'in rotation'. And it does work, I've been using it for months actually and am very happy with it, but (as described in my earlier post) it sometimes fails to pick a song from an album that is 'in rotation' during one of the 999 attempts. The lesser the number of albums 'in rotation' the more it fails. Therefor I would like to see the number of possible attempts go up. 9999 should be okay I think. Additionally it would be nice if the script remembers what song it picked during a failed attempt so it doesn't pick that one again during the same search for a song that meets the criteria.